Set up your Weight & Balance profile and Checklists on the FltPlan website then take them with you on FltPlan Go for iPad and Legacy apps. These features are coming soon to the FltPlan Go Android app. Checklist. Completing the checklist is an important step in safe flying, and FltPlan makes your job easier. With our Checklist tool you can enter a checklist in your account and take it with you on your iPad or Android tablet using the FltPlan Go app for iPad or the Legacy apps. 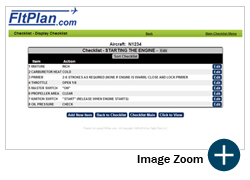 With FltPlan's Checklist you can see each item being checked off as it's completed, ensuring that no step is accidentally missed. There are additional features available with this function such as the ability to quickly transfer your checklist to other tail numbers or to another account. You can also save or print the checklist with a few simple commands. This program also features an optional voice synthesizer. • Once in the Checklist Menu you will see the tail numbers for each aircraft. • Click the Add button and select the type of aircraft. 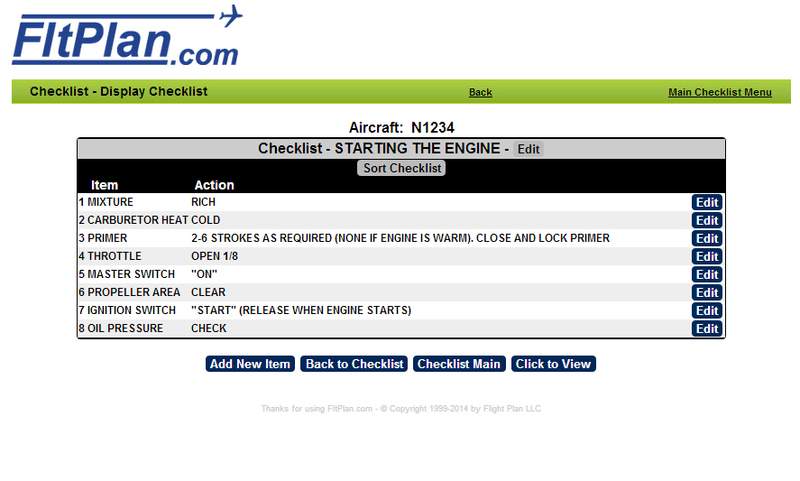 If your aircraft is listed click Select next to the model; if not, select the Custom Checklist. • Click the View button to see the checklist. From the next screen you can add new categories. Click Add New for a custom checklist. To review and edit the pre-loaded categories, click Select. • The next screen is the list of Item and Action within the category that you just selected. If you don't see a checklist for your aircraft, let us know and we will add it. Simply email your checklist to Support@FltPlan.com along with your username and N number. Weight & Balance. No matter what device you're using, FltPlan's Weight & Balance information is at your fingertips. Our free Weight & Balance program is available on the full website, on the Legacy apps, or on the FltPlan Go iPad app. The apps’ Weight & Balance features integrate with your online information. You can import your aircraft weight and balance data directly to your app, with no need to re-enter your aircraft parameters. You can then use this data offline. This is a great tool that will let you do last minute calculations on the ramp or while enroute and planning your next fuel load. FltPlan continues to add more aircraft to our Weight & Balance program. We have more than 450 makes and models of aircraft in our database. Whether you're flying a Cessna C150 or a Gulfstream 280, FltPlan's Weight & Balance can work for you. Click to read our Weight & Balance Tutorial. Click for Weight & Balance FAQs. Voting for this year's Pilots' Choice Awards ends on March 31, 2014. Log into your account to complete your ballot. Click here for step-by-step instructions. Our New Enhancements page provides an overview of new services and features as well as improvements to the existing FltPlan features that you love. The lastest version of FltPlan Go is now available on the App Store. This update includes: Velocity Weather by Baron™, a state outline layer for maps, and Breadcrumbs on Approach Plates. Download it today. Keep up with the latest news and information about the FltPlan website, apps and premium services. Click here to follow us. Use the pre-loaded templates or create a custom checklist based on your requirements. All rights reserved. © Copyright 1999-2014 by Flight Plan LLC.